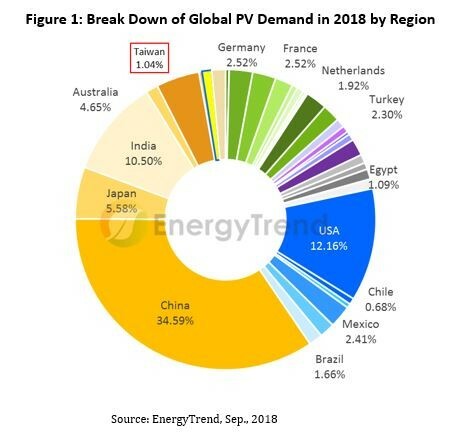 By 2025, Taiwan aims to reach a cumulative installed solar PV capacity of 20 GW. However, by mid-2018, just 11.2% of thisgoal had been met. TrendForce analyst, Rhea Tsao, examines the situation and discusses what needs to be done to reach the target. To boost development, the government has introduced a number of measures, including releasing land for PV projects, and introducing new policies. 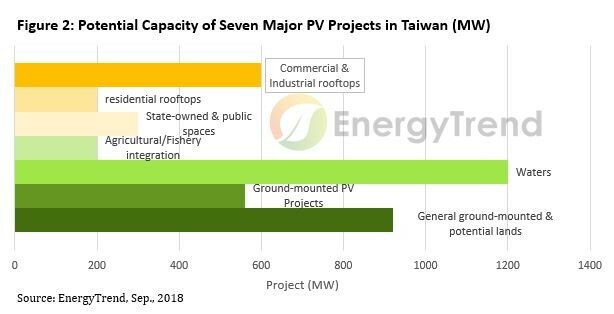 Under these changes, Taiwan’s grid-connected PV capacity grew by 470 MW in the first half of 2018 – a new high record – thus taking cumulative capacity to 2.24 GW. Building ground-mounted power plants is the key to increasing the capacity; however, current land resources suitable for ground-mounted power plants are all remote areas with nopower grid or transmission lines. To improve the situation, the government released 2,385 hectares of subsided farmland in 2015 and 2017 for the development of PV projects(see figure 2), and has passed the planning and building of power grids and transmission lines to the Taiwan Power Company. This year, meanwhile, it has made land available for projects with a total capacity of 3.98 GW. Although the Taiwan Government has been actively promoting the development of new energy with supportive policies announced, the shortage of land remains a key obstacle. So far, the land released by the government is not enough to fulfill the goal of 20 GW of cumulative by 2025. The support of the public – in terms of land use, as well as the planning of transmission lines and the power grid – will thus play a decisive role in Taiwan’s energy transformation.